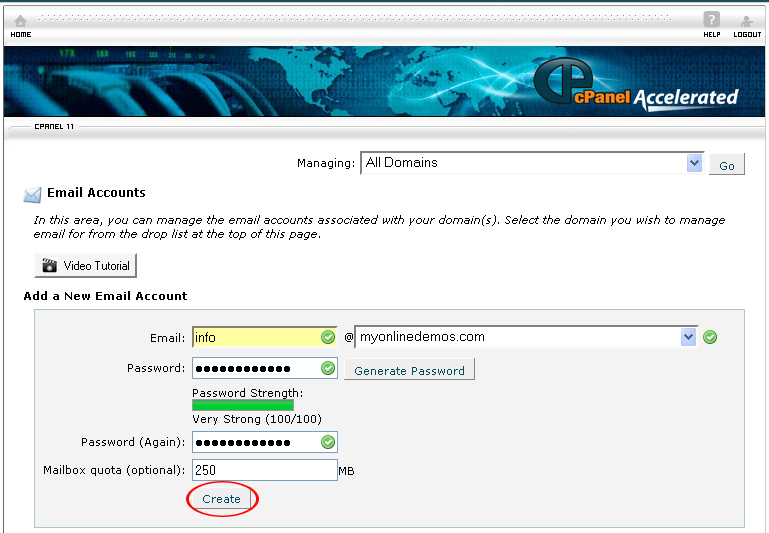 You can add a new email account to your domain through the Email Account functions located under the Mail feature box. Once you have accessed the email account page, you should type in the prefix for the email address in the Email field. If you installed several domains, you must select the appropriate domain from the drop down menu. After you have created the email account, it will be showed on a table below. The table contains features such as usage, change quota, change password, and configure mail client. If you forgot your password, you can change the password by clicking on the Change Password button in the table. You are not required to fill in the old password. However, you are required to type in the new password. 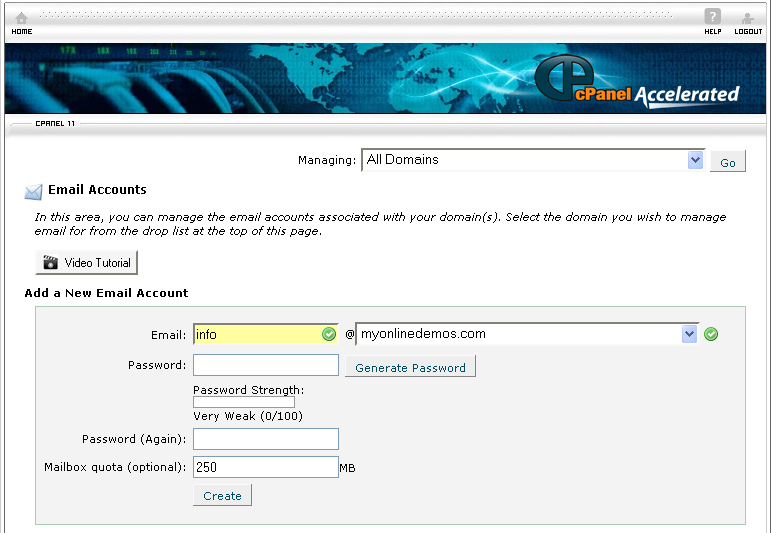 If you prefer cPanel to generate a password, you can use the password generator. The Password Generator can generate a strong password for you. To generate a password, click on the Generate Password button. After you have created a password, be sure to write down the password on a notepad. The quota limit is the amount of space allotted to the mail box. The higher the quota limit, the more email messages can be stored in the mail. If you frequently received a lot of messages, you should set a higher quota limit for your email account. Once the quota limit is reached, other emails cannot be delivered into your inbox until you have deleted the email messages in the inbox. Therefore, it is important that you always monitor your email account to make sure it does not reach its quota limit. If you no longer want to use the email account, you can delete it by clicking on Delete. To access your email account through a third party email client such as Microsoft Outlook or Mozilla Thunderbird, click on the Configure Email Client. You will be provided information such as mail server username, incoming mail server, and outgoing mail server. 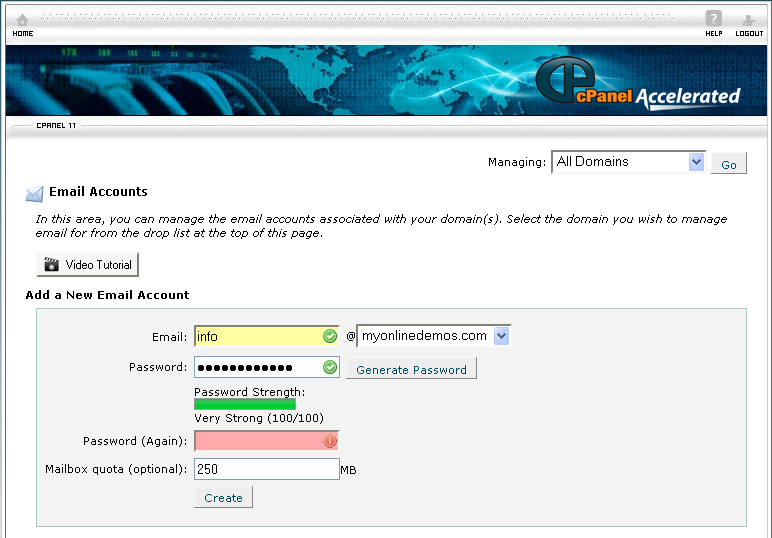 On the homepage of your cPanel account, click Email Accounts under “Mail”. Select a domain from the drop down menu. Enter a username id in the Email text box. Enter a password in the Password text box. If you prefer a generated password, click Generate Password. After that, copy the password and paste it into a notepad. Enter the password again in the Password (again) text box. You email account is now successfully created. On the same page, you will be asked whether you want to configure the account with a mail client. If you want to configure the email account to a mail client, click Yes. If you don’t want to configure the email account to a mail account, click No or Go Back. If you click Yes, you will be given information for the mail client configuration for the newly created email account. By following the guidelines above, you will be able to create a new email account on your domain through cPanel.